For the album by The Hamsters, see Open All Hours (album). Open All Hours is a British television sitcom created and written by Roy Clarke for the BBC. It ran for 26 episodes in four series, which premiered in 1976, 1981, 1982 and 1985. The programme developed from a television pilot broadcast in Ronnie Barker's comedy anthology series, Seven of One (1973). Open All Hours ranked eighth in the 2004 Britain's Best Sitcom poll. A sequel, entitled Still Open All Hours, was created in 2013. Albert Arkwright is a pragmatic, miserly man with old-fashioned values, whose world seems to stop at his shop door, except for his uncontrollable lust for Nurse Gladys Emmanuel, which may prompt him on occasion to wander across the road, usually with a ladder, to gain access to her bedroom window. Arkwright is a devious and mildly dishonest character, who has many crafty tricks to try to persuade a customer to leave his shop having bought at least one thing, and will avoid spending his own money at all costs. He is also very protective of his savings, keeping some in his pocket wrapped in a fine gold chain, and some in an old, battered Oxo tin that he hides under the kitchen sink. This includes, or so he claims, coins from before 1922, when they were "solid silver". Granville is the son of Arkwright's sister. She died a single mother when Granville was very young, leaving Arkwright to bring up the boy. Arkwright's jokes imply that his sister was promiscuous; he frequently speculates that Granville's father is Hungarian, and was forbidden to marry Granville's mother because she was English. He is often referred to as a "youth" or "young lad", even though Granville is well into his adult years. Granville is shy and awkward, but kind. His priorities differ from those of his uncle. He always feels that life is passing him by. Occasionally, people from Granville's past come into the shop. To Granville, who is ever saddled with his shop duties and bearing his uncle's belittling, their lives seem richer and more fulfilling. When Granville has a fling with the milkwoman (played by Barbara Flynn), his uncle is unsupportive. Twenty-six episodes of Open All Hours, all written by Roy Clarke, have been produced for the BBC. The show began airing in 1973 with the pilot episode and ended in 1985 after the fourth series. All episodes have a running time of 30 minutes. Lister Avenue in Balby, where exterior shots were set with 'Beautique', the shop used as Arkwright's, on the right. The shop is based on a little store called L E Riddiford in Thornbury, Gloucestershire. Roy Clarke visited this small town whilst travelling and was said to have fallen in love with the shop layout and its owner, Len Riddiford. This shop is referenced in numerous Open All Hours episodes by Arkwright. Ronnie Barker proposed that Arkwright should have a stammer, and this was written into the character. Barker also co-created the premise of the dangerous till. In the series, the shop's antiquated till has a drawer that tends to snap shut suddenly. Even though this terrifies Granville and Arkwright, Arkwright refuses to replace the till due to the cost of a replacement, and because he believes it discourages burglars. By the time of Still Open All Hours, it is suggested that the till is now haunted by Arkwright's ghost as it sporadically opens and closes violently at the mere suggestion of Granville spending money. 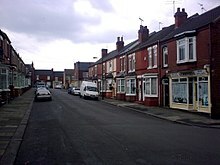 The exterior shots were recorded on Lister Avenue in Balby, a suburb of Doncaster; the shop itself is a hairdresser's salon, which closed for a Summer break each year in order to allow filming by the BBC. The same location is used for the sequel series Still Open All Hours. The pilot episode (featured in the series Seven of One) used a shop front on the western intersection of Drayton Avenue and Manor Road in Ealing, London for exterior filming. In the first series, Nurse Gladys lives at 34 Lister Avenue. This is changed to 32 from the second series. The local council considered demolishing the shop used in Open All Hours. A fan created a web site to garner support for preserving it. The shop was to be auctioned in Leeds on 24 November 2008, and was expected to fetch between £120,000 and £130,000; however, all bids fell short of the reserve price. Three years earlier, a different sort of auction commemorated the programme. The BBC donated, to the British Stammering Association, two of the false moustaches worn by Ronnie Barker in the series. The BSA auctioned the moustaches at their London conference in September 2005, shortly before Barker's death. The show's theme tune is a song called "Alice, Where Art Thou? ", written by Joseph Ascher. It was arranged for a brass band and performed by Max Harris, who also wrote the incidental music for the programme. At the time of the programme's airing, it was widely known[by whom?] that some viewers objected to the show's reliance on a speech impediment for some of its laughs. Even so, Ronnie Barker's character was so amiable and the humour good-natured enough that most deemed it an unmalicious portrayal. Barker also noted in his autobiography "It's Hello from Him" that he received a letter which began "We are a family of stutterers...", that made his heart sink. However, the writer went on to praise his portrayal and added that the whole family found the character hilarious. Two books related to the programme have been released in the UK. One was written by Graham McCann and published by BBC Books in October 2014 and the other one, a 'novelisation' based on scripts for the first series, was written by Christine Sparks and was published by BBC Books. A selection of 15 episodes of the series was released on five VHS cassettes by BBC Video on 28 February 1995, 12 June 1995, 3 June 1996, 2 June 1997 and 2 March 1998. Universal Playback, under licence by BBC Worldwide, released Series 1 and 2 as a three tape boxset on 19 August 2002 and Series 3 and 4 as a three tape set boxset on 2 June 2003. All four series have been released in Regions 2 and 4, both individually and in box sets. Region 1 has released the box set but the series have not been released individually. In Australia, the BBC with Roadshow released "Series One: Episodes 1–3 Comedy Bites" in 2010. In 1984, at which time no new episodes of the series had been produced for two years, a spin-off was proposed based around Lynda Baron's character, Nurse Gladys Emmanuel. Given the working title Call the Nurse, this spin-off series would have followed Nurse Gladys as she visited various eccentric and demanding patients. The characters of Arkwright and Granville were not written to appear, and Roy Clarke was keen to develop a new set of supporting characters rather than rely on those already built up for Open All Hours. A thirty minute pilot was written but did not enter production as the BBC turned down the series; instead, Open All Hours returned for its fourth and what would be final series the following year. A sequel, entitled Still Open All Hours, was created in 2013 by original writer Roy Clarke and featuring several original cast members, including David Jason, Lynda Baron, Stephanie Cole and Maggie Ollerenshaw. On 30 January 2014, the BBC commissioned Still Open All Hours for six new episodes beginning on 26 December 2014. The show later returned for a second series, beginning on 26 December 2015. In January 2016, David Jason revealed that a third series would be produced in 2016. The series began airing on 26 December 2016. The series returned for a fourth series, beginning on 28 December 2017. The series returned for a fifth series, beginning on 7 October 2018. ^ Britain's Best Sitcom:Top Ten, URL accessed 2 December 2006. ^ Famous TV shop faces demolition BBC News Online. Retrieved 4 April 2007. 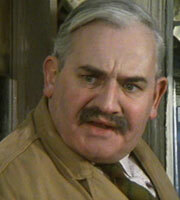 ^ "'Open All Hours' shop to be auctioned". Digital Spy. ^ "Open All Hours shop fails to sell". BBC. 25 November 2008. Retrieved 25 November 2008. ^ "Alice, Where Art Thou?, by J. Ascher (1829–1869)". mutopiaproject.org. ^ Credits at the Internet Movie Database. ^ "Open All Hours". Amazon.co.uk. Retrieved 7 June 2014. ^ "Still Open All Hours: The Story of a Classic Comedy". Amazon.co.uk. Retrieved 7 June 2014. 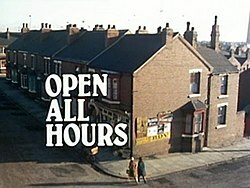 ^ "Still Open All Hours commissioned for full series". BBC News. 30 January 2014. Retrieved 31 January 2014. ^ "The Chuckle Brothers: To me, to you... to Swansea!". South Wales Evening Post. 19 June 2015. Retrieved 19 June 2015. ^ "David Jason confirms Still Open All Hours will return and reveals his Hollywood dream". The Mirror. 20 January 2016. Retrieved 21 January 2016. Open All Hours at BBC Online Guide to Comedy. Open All Hours at the British Film Institute. Open All Hours at the BFI's Screenonline. Open All Hours on IMDb . Open All Hours at British Comedy Guide.